The very disadvantages that increase a woman's risk in pregnancy and child birth - like poverty or lack of education - also make her less likely to be able to attend health facilities. 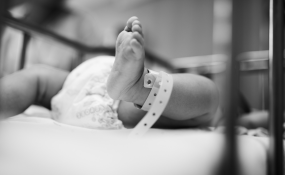 For those who do go to health facilities during their pregnancy, the standard of care is often poor and could be compromised further if the overstretched facilities had to cope with increased demand. We undertook a trial to test the impact of universal home visits - carried out by trained female and male "home visitors" - in Bauchi, a state in northern Nigeria. These were different from other home visits because they covered all households and pregnant women in an area, ensured that the most marginalised women were reached, and were based on local evidence about risks - like heavy work or domestic violence during pregnancy - that households themselves could tackle. They also included men. Male visitors shared the same evidence about risks with the pregnant women's spouses. After one year of the intervention, we compared outcomes over four areas, which we call wards. Two which had received visits - totalling 1,837 women who had given birth - and two which hadn't, with a total of 1,853 women who had recently had their babies.